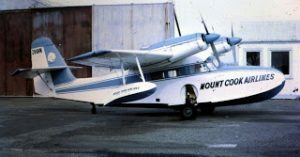 Some time ago I came across a photo in “Wings Over New Zealand of the Grumman Wigeon that used to service Stewart Island. Below is a reprint I posted on the Wings website of my musings about AVM. 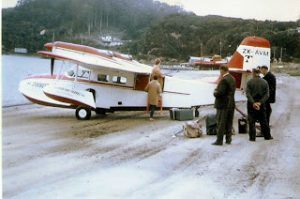 When I first shifted to Stewart Island in 1969 ZK-AVM was on service between Invercargill and Halfmoon Bay, as well as almost anywhere around the Fiordland and Stewart Island Coasts, and onto any inland body of water big enough. I flew in her more times than I can possibly remember. 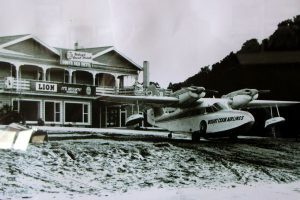 John Hassett and Murray Donald were the pilots I remember, although there was one other whose name escapes me, but who I think was killed flying with a film team over the Hauraki Gulf. Our daughters first flight at 3 days old was back to the Island after my wife came out of the home, but as we changed over to the Islanders when the airfield was finished 30 odd months later I doubt she remembers it. Although we did see AVM on the beach in the Bay of Islands in the ’90’s. Landing in Halfmoon Bay did of course depend on wind direction, and if southerly south east, easterly or northerly then the approach was down one of the gullies leading into the bay. And those gullies where the roads went all had telephone lines with flags on them across them , which used to intrigue the visitors until it was explained to them. No power lines in those days. I drove a scraper during the airfield construction, and at the west end was a large dead tree, quite high, maybe 15 metres. As we brought the field down to grade one of the pilots started doing approaches, and was always complaining about the tree right in the flight path. We refused to flatten it, as it did at least keep him up at a semi tolerable height. Very disconcerting to have a wing go past you at head height (or so it seemed) when you were concentrating on your machine. Don’t know if he ever had punters aboard, but if he did they would have had a thrill. Take off in westerly winds from Halfmoon Bay was always in toward the shore, with the run staring well out beyond Leask Bay. Even with a full load the aircraft would unstick a a couple of hundred metres outside of the moored boats. There the procedure varied depending on the pilot. One used to climb steadily after unsticking, and turn away to the South West through the “gap” between the village and Golden Bay. The other pilot would unstick, and then hold the aircraft down close to the water and build up speed before hauling her up steeply just before the moored boats, and then through the “gap” often down below the level of the higher houses. I watched that same pilot take off in light easterly once. Last flight on Xmas Eve, so in a hurry to get home, and no passengers. No Taxi=ing slowly down the beach and into the water, then raising the wheels. He had a fair amount of power on, and hit the water at speed, with the wheels on the way up. He was airborne before the end of the wharf. Like I said… in a hurry. 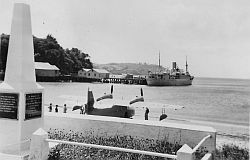 The photo below shows the scene, with the GVT vessel Matai at the wharf. 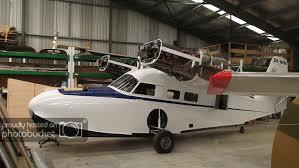 So I was delighted to see that AVM is being rebuilt, and I hope once flying again, that the new owner brings her down. The older residents will give her a great welcome.